LIGHTWEIGHT AND COMPACT FINGER SPOOLS. AVAILABLE IN TWO SIZES WITH TWO LINE MATERIAL OPTIONS. In the early days of cave diving, reels were not available to buy off the shelf. Divers used anything they could, including empty electrical wire spools. When exploring, divers would pay out the line and if they didn't empty the spool it would be left in the cave for the next dive. The spools came in various sizes before North Florida cave diver, Bill Hogarth Main, popularized smaller spools for safety and jump reels. 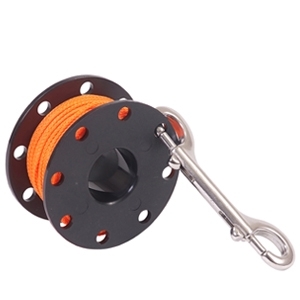 Today, our small 15m/50ft Finger Spool is most often used as a gap reel or for short distance exploration and our larger 38m/125ft Finger Spool is often used for shooting lift bags as well as a safety reel. 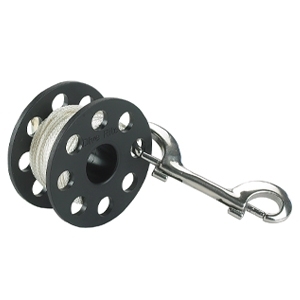 Small and low-profile, a spool fits nicely out of the way in a pocket or clipped off to a D-ring. The holes in the side allow for clipping in the double ended snap anywhere along the perimeter of the spool to keep the line tight when not in use. Made of ABS plastic, our finger spools are simple to use and virtually indestructible in the water. Each Finger Spool comes standard with a large stainless double ended clip. Available with #24 white DuPont or orange hi-viz Dacron line.